As ODOT continues to provide safe and efficient transportation system through the construction, rehabilitation, and maintenance of roads and bridges, ODOT's cultural resources program reviews those projects that receive federal aid to ensure compliance with federal and state environmental laws. These laws require consideration and/or protection of historic properties in the development of ODOT's federally-funded projects. In order to ensure that historic properties are identified and considered, ODOT consults with the Oklahoma SHPO, federally recognized Native American Tribes, and local, state, and national groups who may be interested in cultural resources affected by transportation projects. 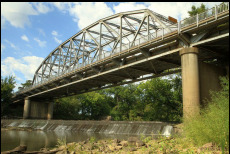 ODOT has completed a design analysis for the SH-66B over Captain Creek bridge near Wellston on historic Route 66. The bridge is listed on the National Register of Historic Places. ODOT will rehabilitate the structure. More information is available here. ODOT is considering improvements to the crossing of US-281 over the Canadian River, which is a former alignment of Historic Route 66. Project information for this project is available here. ODOT has considering improvements to the crossing of US-60 over Horse Creek, which is a former alignment of Historic Route 66. The bridge is listed on the National Register of Historic Places. Project information for this project is available here. ODOT is considering improvements to the crossing of SH-123 over the Caney River in Bartlesville. The project contains a historic bridge and dam in Johnstone Park. Information available here. ODOT is considering improvements to the SH-15 corridor east of Shattuck. The project involves the potential extension of four concrete bridge-class culverts and five cast-in-place concrete drainage structures that were constructed in 1935 as part of a National Recovery Work Relief (NRWR) program. Find more information here.